A big thank you to our elder son who dropped by to test out his newly purchased Sigma 150mm macro lens in our garden and chanced upon this beauty, otherwise definitely I would have missed out this dragonfly’s visit. More so on a gloomy and drizzling evening, when I was glued in front of my personal computer, drafting a post on Bauhinia Kockiana, a fabulous tropical vine. 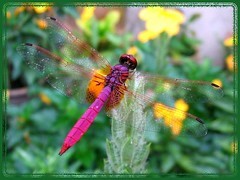 This attractive medium-sized dragonfly, Trithemis aurora, is truly a handsome male that can be easily identified. Its head is crimson red and body beautifully hued in deep purplish-red to vibrant magenta pink, with red markings between segments. Absolutely fabulous! 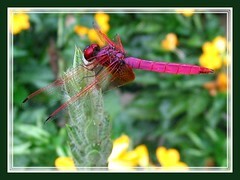 The wings are transparent and neatly veined in red, with black wing-tips. The base of hind wings present a combination of yellow and brown. A peculiar characteristic of the many species within this subfamily ‘Trithemistinae’ (Dropwings) is, they will almost immediately lower their wings upon landing. The female species on the other hand, has a golden-yellow to light brown body with darker markings that stands in sharp contrast with its male counterpart in deep pink and crimson tones. Hehe…quite the reverse from us human beings! Habitat: Ponds and small lakes close to forest areas; weedy drains, sluggish streams and low secondary vegetation. Distribution: China, Guangdong, Guangxi, Hong Kong, Hainan, Taiwan, Japan, Laos, Vietnam, India, Sri Lanka, Thailand, Myanmar, Malaysia, Singapore, Indonesia, Philippines and Middle East. What a wonderful surprise! Such gorgeous blue eyes it has – I’m so delighted to have shot this frontal view! 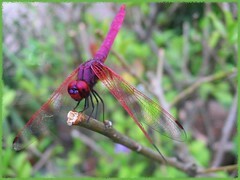 This handsome pink dragonfly came visiting again on July 4 in the late evening, almost the same time it was last seen in our garden about four months ago. This time, it flew straight onto the leafless branch of our Brunfelsia calycina bush that was given a heavy trim a few days before. Thank you so much for the great pictures and information!! it helped a ton!! You’re most welcome, Lilly! Happy that you’ve found it helpful. 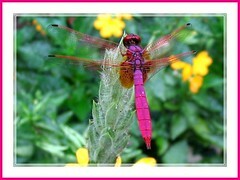 today noon 9/17/11 I saw this pink dragonfly today for the first time! It was an awesome site. I love the colors of nature. Lately I have been seeing bright orange bugs of all shapes and sizes! I was fishing and a pink dragonfly landed on my fishing pole i took a pitcher of it and everyone i know has never seen one. Hi Lisa! I’m sure it was delightful to be able to see God’s wonderful creations in every aspect, yeah. May our eyes be open to every opportunity to enjoy Mother Earth.